I do hope you have been enjoying the lovely March sunshine! A couple of special dates have been on our Programme this month. 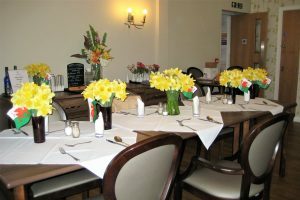 Residents woke up to lots of Daffodils and Flags on St. David’s Day……on the Monday after exercising we celebrated with a St. David’s Day Quiz followed by listening to rousing Welsh Choir music. On St. Patrick’s Day Residents were treated to a Guinness Cake and tipple!……… again after Exercising on the Monday we had another Quiz this time about St. Patrick’s Day with both Residents and Visitors joining in followed by some lovely haunting Irish music. Brrrrrrr!!! Hope you are all keeping nice and warm. January has seemed to have come and gone in the blink of an eye! 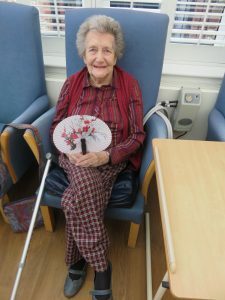 Busy as usual at the Manor…our lovely Residents have enjoyed Flower Arranging with Joyce and Sam as well as many varied visits and entertainment. 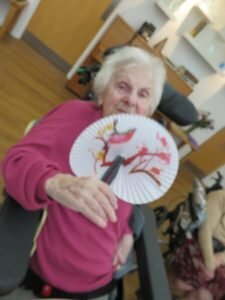 We have enjoyed a couple of ‘Mind Benders’ sessions after our exercising from our chairs…..Triads being one of them with our ladies and gentlemen calling out the answers of the third word….e.g. Animal, Vegetable and …….Mineral. Butcher, Baker and…….Candlestick-maker. Snap, Crackle and……Pop. There was only one that none of us had heard before….Winken, Blinken and……Nod. There were 21 examples and 20 were answered correctly! We also had….Name a Song Sung by different singers. Again we had 20 artistes on our list including….The Batchelors, Max Bygraves, The Andrews Sisters and Judy Garland to name just a few. We had correct answers for every one! We could not let ‘Special Christmas Gifts’ and memories from years gone by at Christmas be left out of our Reminiscence Session so here we go….A red ball, Spinning top, Skipping Rope with wooden handles with ball bearings in….a baby doll…..Christmas Stockings and Pillow Cases…..an apple, orange and new Penny…..a Teddy which over the years lost most of its fur. We also remembered silver coins put into Christmas Puddings…..not now…Health and Safety!!! One gentleman remembered gathering around a piano having a sing-song…his father Tommy having had Pints of Beer lined up on the top! Hope none were spilt! We enjoyed a wonderful celebration ‘Rabbit Hole Club’ for Zoe’s 11th year at Valerie Manor…see separate photos and write-up. Wonderful food prepared by Preeda and Steve not forgetting the Cake made also by Preeda. 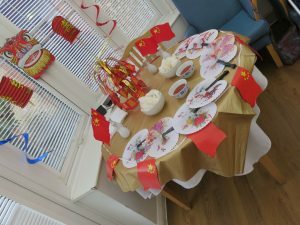 Lovely staff looking after everyone both Residents and Visitors on the evening. Many ‘old’ faces joining us on this special occasion too! Wonderful to see so many of you Celebrating with us…thank you. A huge Congratulations Zoe from Mum and Dad…..not forgetting the never ending support, hard work and care from dear Alan and her wonderful staff. Oh it has been so windy and wet of late…but it is November/December so it is to be expected! We enjoyed a lovely morning on 11th watching the Remembrance Service with lots of our ladies and gentlemen and some visitors in the conservatory. That prompted one of our Reminiscence Sessions….remembering the first and second World Wars. One ladies parents came from Scotland and her father was in the Border Regiment….another’s father was in the Kent Regiment where the Cavalry horses brought guns to the troops….being part of the Artillery was another memory and later on in the Civil Defence. Another memory this time from the second World War was a family member being in the Army and having shrapnel in his thigh….another husband was in the Navy clearing mines by exploding them ….then another husband flying in a Lancaster in the Airforce……one sailor travelling all over Europe had a nasty experience of a torpedo going under the ship and out the other side. A lady remembers being evacuated to Stafford with her younger brother when she was 5 years old and was away from home for 2 years….some sad, some happy memories but memories all the same. To lighten the mood I must let you know what really put a smile on everyone’s faces…..one of our lovely ladies had some visitors…..daughter-in law, granddaughter and great grand children! 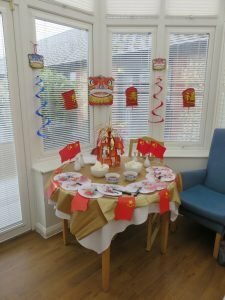 I don’t know if any of you have seen the programmes on children visiting the elderly but my oh my it was absolutely amazing the way everyone was smiling on the arrival of the TWINS!! The little ones were so good and made everybody’s day by smiling and being an absolute delight….it truly made everyone’s day…thank you so much for visiting! The run-up to the big day is on….lots going on at the Manor do join us when you can.